Qatar Airways exempted from ban on electronic devices on board all US-bound flights from the five-star Hamad International Airport. Airline committed to US expansion on its ultra-modern long-haul fleet with forthcoming launch of service to San Francisco. Qatar Airways serves 10 destinations across the US, including double-daily flights to New York, soon to feature the airline’s new Business Class Qsuite. Qatar Airways, the World’s Best Airline as voted by Skytrax 2017, is delighted to confirm it has been approved by the U.S. Department of Homeland Security to permit passengers to carry personal electronic items on board U.S.-bound flights, departing from its hub Hamad International Airport in Doha, Qatar. The airline gained the exemption earlier today after U.S. officials inspected the security measures in full operation at Qatar’s state-of-the-art Hamad International Airport (HIA), an airport recently awarded five stars by Skytrax, the first airport in the Middle East to be bestowed with this recognition. 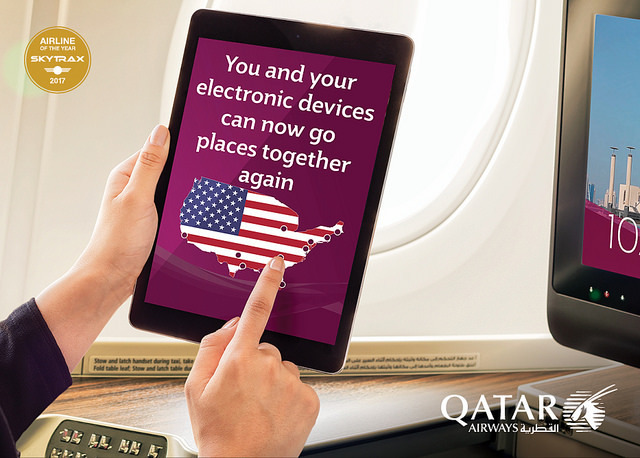 With the lifting of the electronics restrictions, passengers departing from HIA to all Qatar Airways’ U.S. destinations will be able to carry their personal electronic devices on board, and have uninterrupted use of them for business and leisure purposes throughout their flight. Qatar Airways Group Chief Executive His Excellency Mr. Akbar Al Baker said: “We are pleased to announce that the electronics ban has been lifted from Qatar Airways flights departing to all destinations in the U.S. Safety and security are always our highest priority. They are expressed throughout all of our corporate values, and must never be compromised. Qatar Airways recently announced its intention to make an initial investment of up to 4.75 per cent in its oneworld partner American Airlines, crediting the airline’s fundamentals, while intending to build a passive position within the company. Qatar Airways has long considered American Airlines to be a good oneworld Alliance partner, and looks forward to continuing this relationship. Qatar Airways has developed a reputation for enhanced cooperation with industry and U.S regulators over the past 20 years, consistently being at the forefront of implementing new measures to enhance the safety and security of its passengers. Qatar Airways was the first airline to achieve 100 per cent compliance with the IATA Operational Safety Audit (IOSA) when the programme was first implemented in 2003, and has since maintained its 100 per cent compliance record. The airline will also bring its award-winning, patented new Qsuite Business Class seat to New York in September, retro-fitted on a Boeing 777 aircraft. Qsuite features the industry’s first-ever double bed available in Business Class, with privacy panels that stow away, allowing passengers in adjoining seats to create their own private room. Adjustable panels and movable TV monitors on the centre four seats allow colleagues, friends or families travelling together to transform their space into a private suite, allowing them to work, dine and socialise together. These new features provide the ultimate customisable travel experience that enables passengers to create an environment that suits their own unique needs. Qatar Airways, which celebrates 10 years of service to the U.S. this year, will launch flights to San Francisco in 2018, as part of its continuing expansion within the U.S. The U.S. expansion is just part of the airline’s global growth plans, which include new routes to Canberra (Australia), Chiang Mai (Thailand), Douala (Cameroon), Libreville (Gabon), Rio de Janeiro, (Brazil), Santiago (Chile), as well as many other exciting destinations.